Abbas Kiarostami, Iranian auteur par excellence, has offered up over 35 films since the 70s, but only the last dozen or so have received a wider audience than his native country. Certified Copy, his first filmed outside of Iran, is certainly his most assured film to date, if not his best. It’s the biggest head trip on the art-house circuit right now, and deserves to be seen ASAP. Certifed Copy begins with a lecture that sets the tone and pace of the rest of the film. James Miller (William Shimell) is a writer who has journeyed to Tuscany to discuss his newest book. It discusses art, and the question of the oft-sought after “original.” Is an original work, the painting that Renoir or Monet actually touched, all that valuable? Or will a sufficiently good copy suffice? 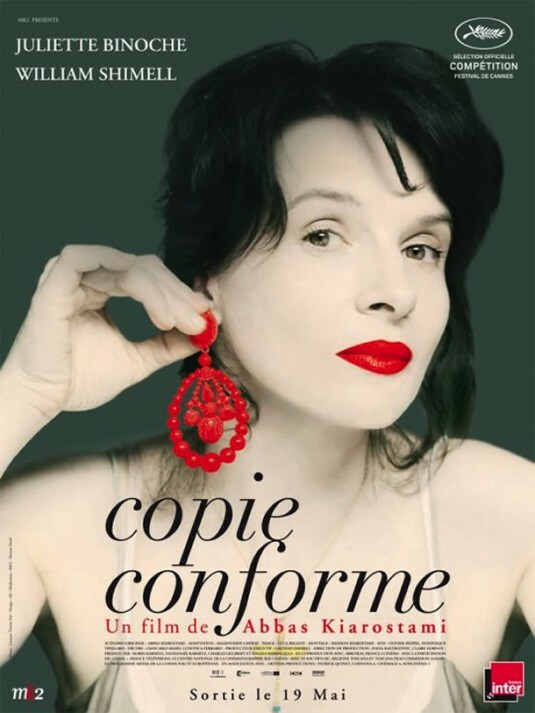 A woman (Juliette Binoche), the curator who put on Miller’s event, is forced to leave his lecture, and suggests that they go for coffee that weekend. They debate his book and his ideas, some of which she has taken issue with, and proceed to share some of their life stories. It is simultaneously professional and informal, almost as if the colleagues are going on their first date. When he is forced to take a phone call, she speaks to the owner of the cafe, who mistakes Miller for her husband. Binoche’s character, never given a name, plays along, and invents a life they have shared together. This is their 10 year anniversary, and he didn’t shave. She seems to be making it up off the top of her head, and when he returns, she informs him of the conceit, and he plays along. As they proceed though the town, however, they begin to talk more and more intimately, never dropping the ruse, until they begin to resemble an old married couple. Kiarostami is no stranger to this kind of role-playing. In 1990, he directed the brilliant film Close-Up, which stands as a quasi-documentary about a man who had actually impersonated a famous filmmaker on a whim, and ended up living with a family while under that disguise. He had no intention of fleecing this family, he only wanted to foster their love of film. After the man stands trial, Kiarostami helped him reconcile with the family, and everyone involved re-enacted what happened, playing themselves, to fill in the narrative holes of the documentary. Kiarostami plays with similar themes in Certified Copy: identity, role-playing, artifice, the power of cinema, and our place within the context of each other. But here he does it a little differently. In the past, he used non-actors and a crew of locals, but here he has the resources to make a film that is fluid and complex. Certified Copy may very well be Abbas Kiarostami’s best yet, and a good omen of things to come. If Abbas Kiarostami interests you, there are some other films you should check out – Taste of Cherry and Ten. The first is about a man who has decided to commit suicide, and drives around Tehran looking for someone to bury him, while the second features a female cab driver and ten passengers she takes on during the day. Both will curl up inside you and cause you to consider your life in ways no other filmmaker has done. This entry was posted in Reviews and tagged Abbas Kiarostami, Certified Copy, Juliette Binoche. Bookmark the permalink.